Julie Bertram, is a CPO®, Certified Professional Organizer®, member of NAPO, the National Association of Professional Organizers, Co-founder of Charlotte’s Elite Organizers, Co-founder of Butterfly Bin (a non-profit community clearinghouse) and adviser to various publications and media. Julie returned an email inquiry within hours...we are new to Charlotte and I was overwhelmed! My biggest project was getting my husband's home office functioning, but I also really needed someone to walk through our new house and offer suggestions about where to store as I continued to unpack. Julie managed all of that. We'll be calling her again as we continue to get settled! Thank you, Julie! I enjoyed tackling your husband's office and look forward to working with you again! 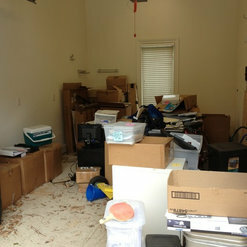 Julie and her team assisted us with some large reorganization efforts within multiple rooms within our home. Julie spent time with us deciding on the best approach and worked diligently to complete the project. I have known Julie since 2005 when we were organizing colleagues. I've always been impressed with her professionalism and integrity. She uses that huge smile of hers to gently keep clients focused while decluttering. and uses her creative energy to make the best use of space. Highly recommend the Organizing Pro. Thank you, Karin! I appreciate your vote of confidence! After a friend's referral, I called the "organizing pro" in complete desperation. They got me in really fast and before I knew it, every big problem area in my home had been tackled. What a life changing experience! Julie and Beth worked together and they are wonderful. With 4 children, we had lot of different types of toys and "stuff". They have children, too, so they can tell the difference between a Poly Pocket and a Calico Critter which is actually a pretty big deal. They brought organizing bins and containers with them which was so nice not to have to worry about. Now the kids can take out something, all of the pieces are together, they can play and easily put it away. They play with their toys so much more than they ever did because it's so easy to access everything and all of the pieces are there. They also organized my laundry room, media closets/cabinets and some "junk" drawers. I really can't say enough! They actually set off a domino affect with me and I have since tackled almost every drawer and cabinet in my whole house. Thank you Julie and Beth! Your welcome. You were fabulous to work with! It is so rewarding for us to hear that the systems and changes we have put in place are making a difference in your everyday life. Also happy that it propelled you into clearing out more clutter elsewhere. Sometimes we all get stuck and just need someone to get us started. Keep up the good work!